K.R. 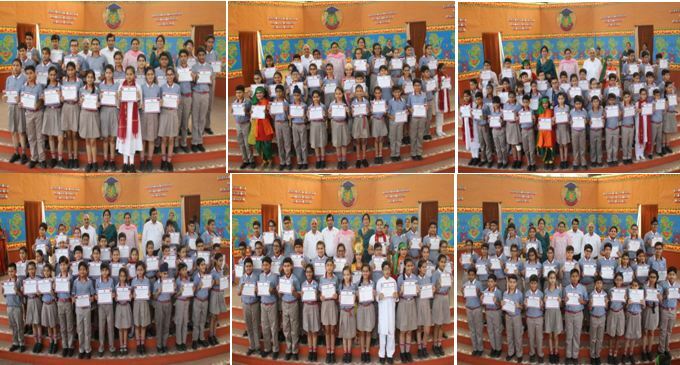 Mangalam World School, GK II observed the Scholar Badge Ceremony of classes V,VI,IX and XI of 2016-17 batch on 4 May 2017 to felicitate meritorious students for their academic excellence. The event commenced with a rendition of the school song by the school choir. The Principal, Ms. Alka Awasthi, welcomed the Chief Guest, Ms. Shalini Singh, an IPS Officer , the Guest of Honour, Sh Jaidev Gupta , the Vice Chairman of K.R Mangalam Group of Schools and praised all the achievers who lived up to the expectations of their teachers and parents and made the school proud. In her thought provoking speech, she reiterated the need to carry forth the school values by giving selflessly, not just to the society, but to the country as well. She encouraged the students to not only pursue their own goals, but also make a difference in the lives of those with whom they associate. This was followed by a mesmerizing dance performance about the ‘portrayal of the divine friendship-Krishna and Sudama’ which enthralled the audience. The much awaited award distribution ceremony saw the distinguished guests and the Principal, giving away awards to the deserving students. As a hallmark of true academic brilliance, the students were awarded special prizes and the scholar badges. It was a proud moment for all present.